Is your organization generating web-based content by the bucketful? Do you ever wish that spiffy, useful content could appear in multiple places so that anyone who might want that content has a better chance of seeing it – with little extra effort and no duplication of content? 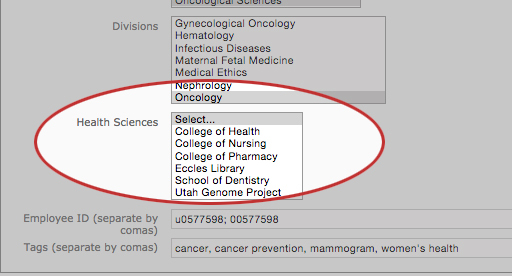 At the University of Utah Health Care system, where I work as the web content manager, we’ve set up a basic tagging structure to make that happen, automatically, every time we hit Publish. At least we’ve made a promising start. The idea of establishing a tagging system started when we identified a challenge: Patients and others who had health questions were missing out on some of the most relevant content because they never knew it was there. Why? All the content our department was generating was sequestered on either our blog page, our podcast page, or our news page. 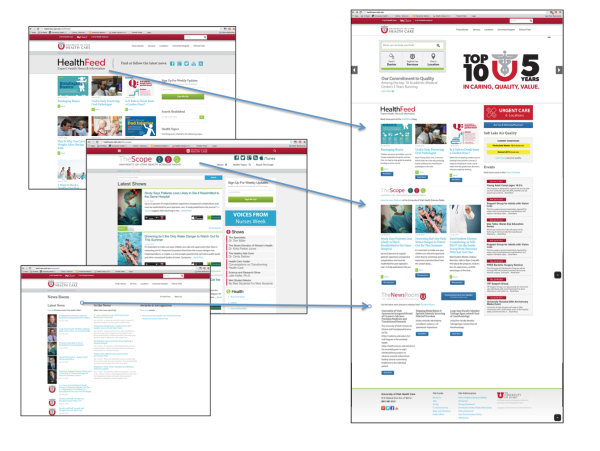 People visiting any of the related University of Utah Health Care websites did not see our blog posts, podcasts, or news stories – even when that content was exactly what they needed. We were, essentially, hiding lots of content – excellent, current, relevant content – from most of our visitors. 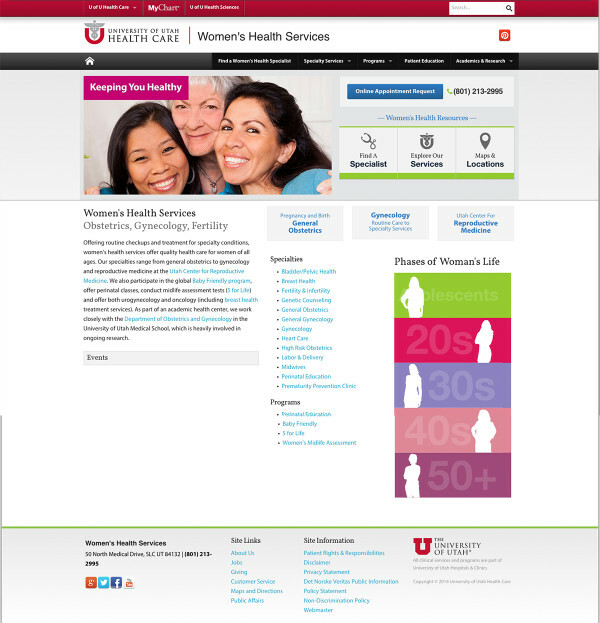 To get our best and most interesting stuff in front of our users’ eyes, we decided to reuse our blog, podcast, and news content across all our websites so that people would see more of what we had to offer on their topic of interest – regardless of the form that content took and regardless of which healthcare.utah.edu site they happened to be looking at. Itching to hear the details? Here’s our story. Before we put our new approach in place, we posted this content on the appropriate pages according to content type – the blog page, the podcast page, or the news page – and we fed the content from these three pages to the home page. But that was it. We didn’t feed this content to any of the other pages where it would have fit right in by topic. 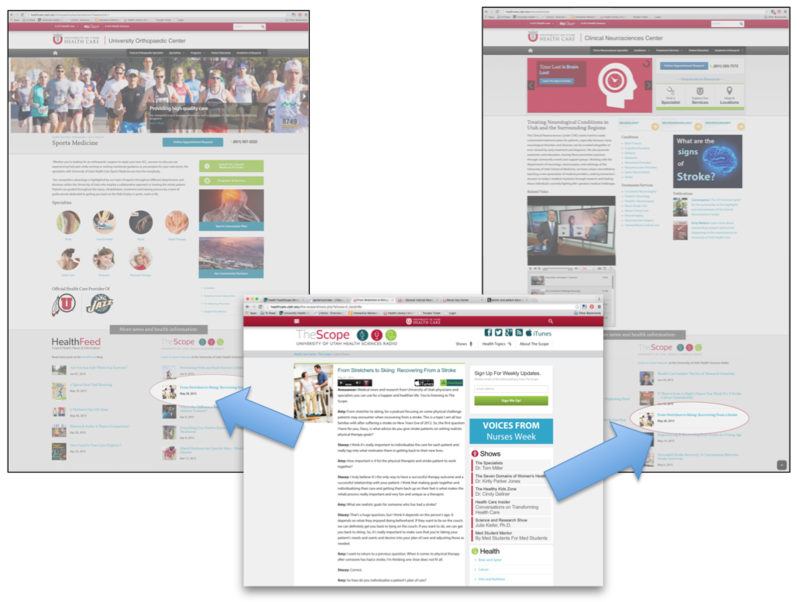 Before we put our new program in place, content that we published almost daily to our blog page, podcast page, and news page (left) was fed to our home page (right) – and nowhere else. The thing is, as many of you know, people rarely enter a website through its home page. They enter wherever Google said to enter. And even if they did find themselves on the home page, they may not care about the most recent content (which is what the feeds show). People wonder what to expect from the kind of cancer their loved one has, or they worry about certain symptoms they’re experiencing. With our uncoordinated content spread over 33 major sites and several more subsites – managed, in some cases, by independent individuals or teams – even our most motivated site visitors were not seeing all the content that was relevant to their health concerns. So we plotted a course to free our content to appear in multiple places where more people who needed it would see it. The easy part was assigning a developer to build and style our content feeds. The hard part was deciding how to organize the stories and which pages they should appear on. Here are the nitty-gritty details of the major tactics we used to develop our tagging system, which integrates and reuses most of our blog, podcast, and news content across all our sites. We identified our major topics. We identified subtopics and even more specific tags. We tagged each piece of content so that it would appear on all relevant pages. We tagged each piece of content so that it would appear on the profiles of the subject matter experts who helped create it. We provided for future content reuse. 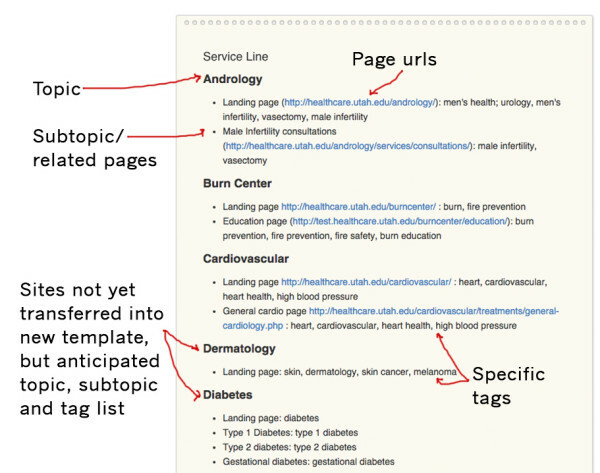 For each home page, we identified major topics and created tags for them. These high-level topics were easy to determine. The blog posts and podcasts had previously been divided into topical indexes – vision, women’s health, children’s health, and the like – so we used the system that was already in place to organize our tagging on a broad level. 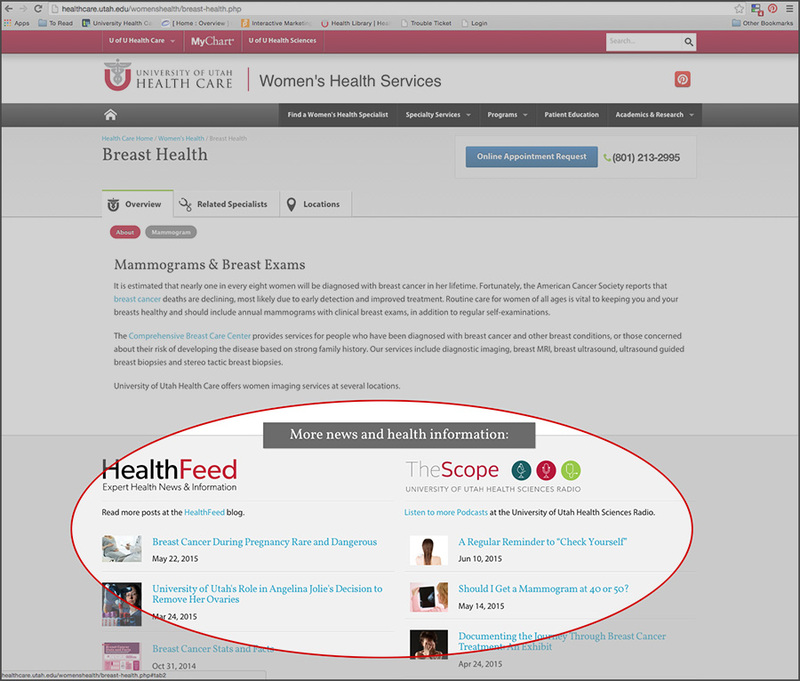 The Women’s Health Services home page now includes aggregated content (feeds) from our blog (under HealthFeed, at bottom left) and from our podcast (under TheScope, at bottom right) for content related to women’s health. These major topic tags (intelligent content practitioners would call them semantic categories) tell anyone – or any machine – what each piece is about in a broad sense. 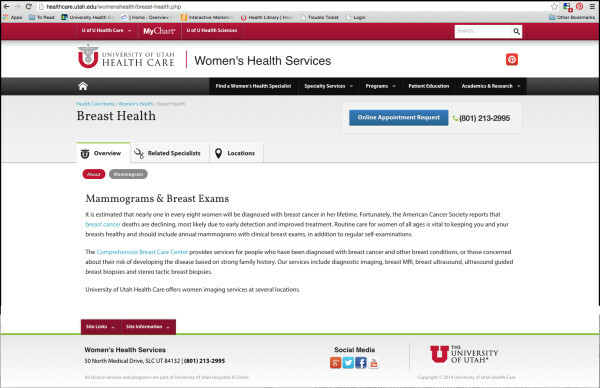 For example, for a blog post about menopause, we would select the high-level topic tag Women’s Health. 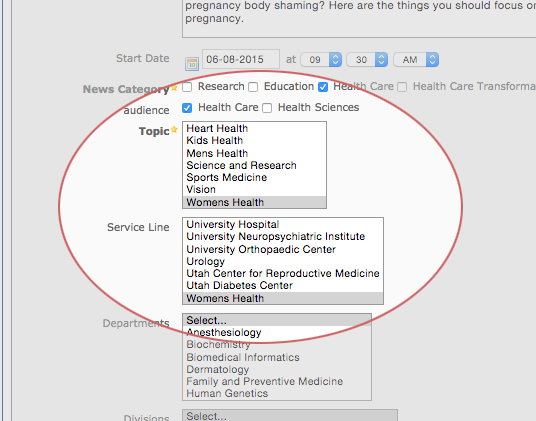 In the authoring tool, our tagging system enables our team members to associate each piece of content with a major topic, such as Women’s Health. As an example, the Breast Health page in the Women’s Health Services site now includes aggregated content (feeds) from our blog (under HealthFeed, bottom left) and from our podcast (under TheScope, bottom right) for content tagged with the subtopics “mammogram,” “cancer prevention,” and other subtopics of interest to this audience. In the authoring tool, this is the tagging field for our subtopic tags. 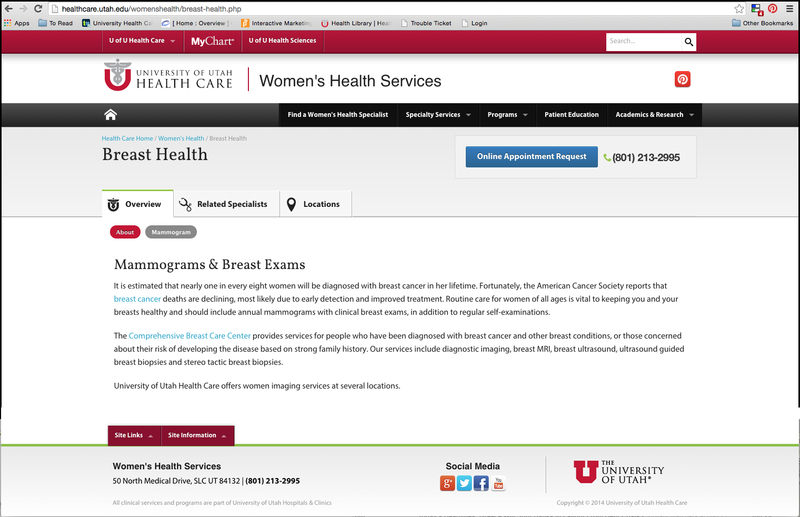 For example, this is where we would tag a mammogram-related blog post with the subtopics (tags) “cancer,” “cancer prevention,” “mammogram,” and “women’s health,” as shown here. I spent a week or so sorting through around 500 blog posts and 800 podcasts to identify the best topics, subtopics, and even more specific tags to use and to decide whether each piece could be aggregated into more than one web page. We keep a master list of all this metadata (as shown below). Members of all three content-creating teams consult this list when they enter new pieces of content into the system. This screenshot gives you a peek at our master list of metadata – the topic tags, subtopic tags, and even more specific tags we assign to blog articles and podcasts to feed them to the appropriate pages. We even assign tags that will feed this content to pages that don’t exist yet. Eventually, when the aggregation function is added to certain upcoming site redesigns, our content will automatically appear on those new pages based on the tags we assign today. Many of our content pieces, although created by a subject matter expert in a specific topic area, apply to another topic or subtopic as well. For example, a piece about a stroke patient working with a physical therapist in orthopedics to ski again can also apply to the neurosciences clinic site that has information about strokes and stroke recovery. Metadata tags enable a podcast about a stroke victim working to ski again (shown at center on the podcast page) to automatically appear on both the Sports Medicine page (left) and the Clinical Neurosciences Center page (right). Since most of our content would not exist without our subject matter experts, we included a way in the tagging system to associate content pieces with the clinicians or specialists quoted or interviewed for the piece. This tagging eliminates a step in the process of posting clinicians’ latest blog posts, press releases, and podcast interviews on their profiles. Since many of our users search for the people who treat them, listing this content on the profile pages gives users yet another way to find the information they need. 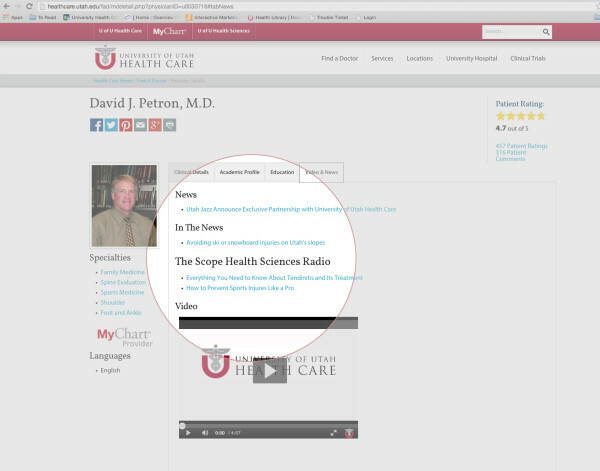 Example: Dr. David Petron’s profile lists recent blog posts, press releases, and podcast interviews in which he has been tagged. In the authoring tool, this is our tag field for the subject matter expert quoted or interviewed in the content piece. Besides the health care site, we have many additional sites in our health system that are built for different audiences. 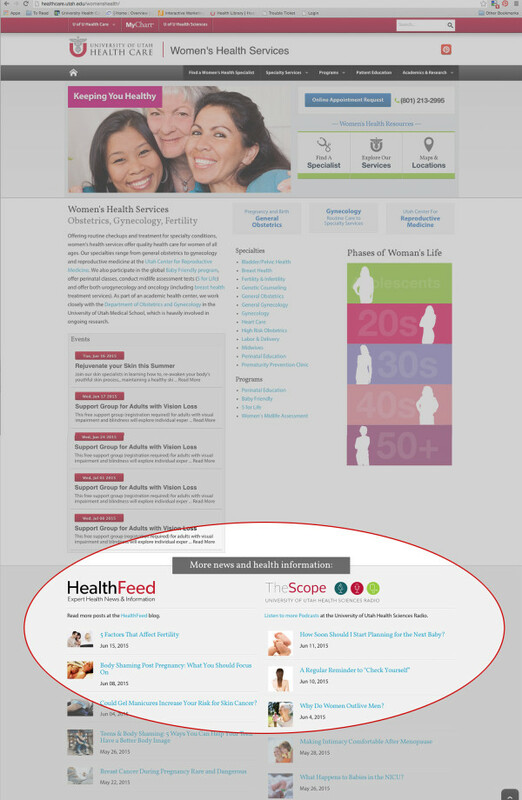 Much of the content we create for the health care site could apply to topics on those other sites. To prepare for future reuse of content that crosses over into these sites, we have included additional tagging options. 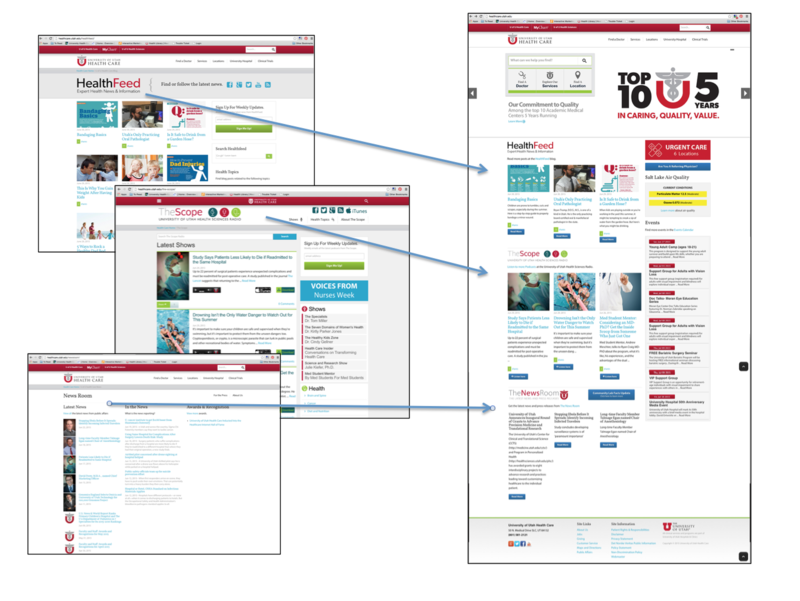 For example, the College of Health, College of Nursing, and College of Pharmacy all have their own websites. Any blog posts or podcasts that we tag with the College of Nursing subtopic will eventually be fed into the new College of Nursing site when that site integrates the template with the new tagging structure. In the authoring tool, these are some of the subtopic tags from which we can choose for the future use of other content teams, such as the College of Nursing, when we incorporate this tagging system into their new site. Certain sites are not yet set up to accept our feed; we’re working toward that goal. We will steadily turn out sites with this tagging structure for the next year. We will also feed content created by these other teams throughout sites on which we manage the content. These options to post content on related sites create promising new opportunities. Let’s say someone in the College of Nursing wrote a great interview with a patient and nurse dealing with a stroke. When the College of Nursing site is integrated into our tagging system, we’ll be able to tag this interview to feed onto any other site that features related content. While we haven’t worked out the specifics of who can tag what to show up where, we are preparing for the possibility of more intelligent content and more content creators! Recently we got some excellent feedback – a moment of truth. While meeting with the Geriatric Clinic, I learned that this team wanted to fill out its site, add content, and give visitors more resources. They hadn’t looked at their site for a while. They were delighted when I showed them that it already appeared considerably more robust because of the content we had integrated into it. 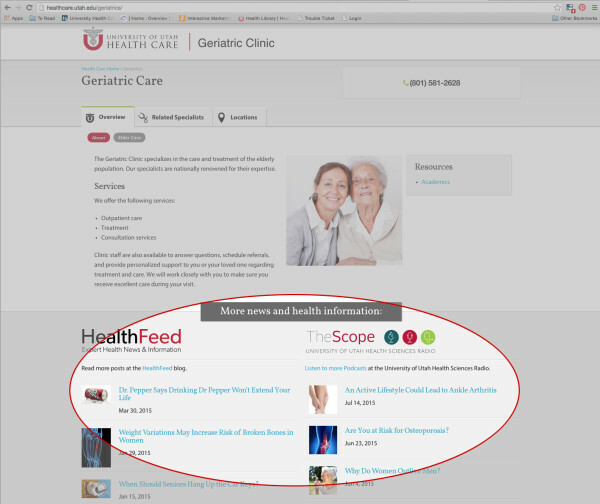 Using the tags “aging,” “elder care,” and “arthritis,” we now feed any stories related to geriatric health to the Geriatric Clinic site for their visitors. The best part? No one at the clinic had to write or assemble any new content (or even copy and paste content). We automatically populated their pages for them with up-to-date, relevant content already created by sources unrelated to their clinic. Talk about easy reuse! Our marketing team’s blog posts and podcasts related to aging, elder care, and arthritis automatically appear on the Geriatric Care landing page. No one at the Geriatric Clinic has to do a thing. Our freshest content is served up in more than one place at the same time – increasing the chances that people looking for that content will find it. Fifteen or more web pages (including some with little content of their own) suddenly include more relevant content – with no extra time or brainpower required. We can take advantage of our fellow content creators on other teams (paid for by other departments!) to help us do a more effective job of providing the latest news and expert commentary on health and health topics. Our subject matter experts love that their content is seen not just on their own profile, clinic, or specialty page, but also on other relevant pages. The content tagging structure we have implemented on our blogs and podcasts has helped us reuse content that we are already generating and match it more closely to similar topics and audiences across our sites. By doing this, we have generated greater satisfaction among our subject matter experts, used content in unexpected – scalable – ways, and prepared for future websites to use our current content and the addition of future content creators in other departments. Do you help manage a large website with subsites whose topics sometimes overlap? Have you wished that you could surface some of your pieces of content in more than one place so that more people could benefit from them? Is someone on your content team motivated to create a tagging system that would make this wish come true? If you answered yes to these questions, then what has worked for us might work for you. 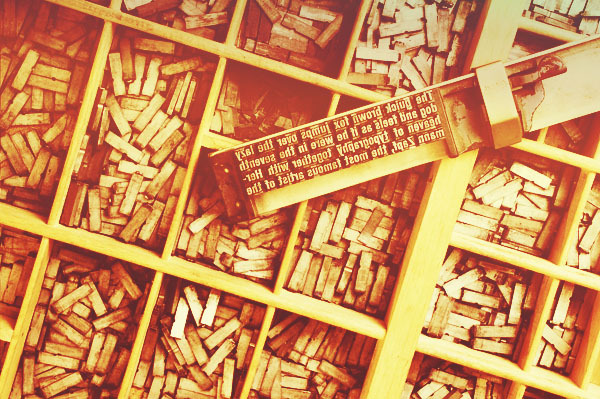 Consider taking these five steps to organize your own content for widespread, automated reuse. 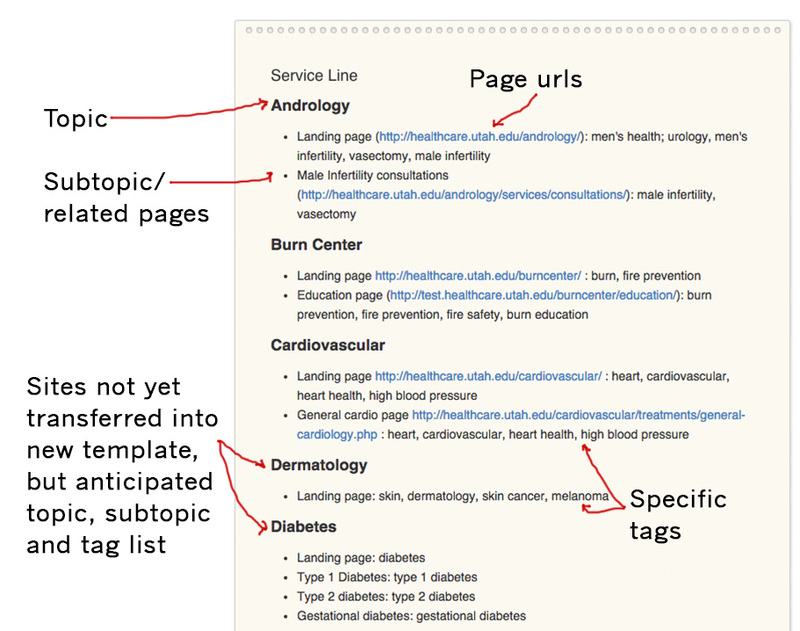 Identify subtopics and, if appropriate, even more specific tags. Tag each piece of content so that it can appear on all relevant pages. Tag each piece of content so that it can appear on the profiles of the subject matter experts who helped create it. Provide for future content reuse. Do you already have a content tagging structure in place? 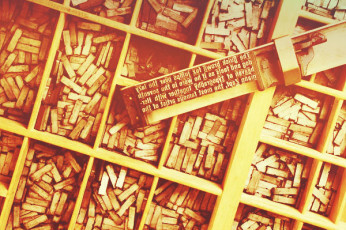 Even if you don’t, can you identify areas of your content that beg to be reused? We’d love to hear your ideas or implementation strategy in a comment below. Jen Brass Jenkins, MPC, is a web content and project manager for University of Utah Health Care. She has created, written, and edited content for medical apps, websites, blogs, marketing materials, and other stuff. Before joining the marketing and communications industry, she worked in theater for several years learning skills that turned out to be project management and client relations. Jen is a bibliophile, perfume fancier, crime-show junkie, donut thief, and occasional blogger. On the home front she answers to two felines, Ampersand and Apostrophe. She uses her kitchen as an artist’s studio and aspires to meal preparation and cooking. Connect with her on Twitter @chrliechaz.